Description: Norfolk Southern Eastbound Manifest Train 18G Passes South 13th Street. Description: A Dash 9 takes the stage as the Ex-CR Dash 8, and NS 6643 hang back in the yard. That SD70M-2 is still peeking from behind the Conrail. Description: Love catching the Norfolk Southern SD60's. Description: Brand new sign atop the cantelever signal bridge tells the crew the new channel for terminal operations "Change to Terminal Channell AAR 42"
Description: Behind the VFW, 0754 hours. 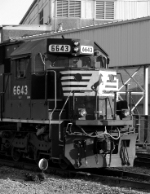 Description: An SD60 and a Dash 9 on the engine track at E-Rail Yard. Description: 17th Ave., 0826 hours. Description: Rockefellow Mill Road, 1136 hours. Description: A pair of NS SD60's lead train 17W west through Whiting, Indiana.